The records of Hill End Hospital are held at Hertfordshire Archives and Local Studies (HALS), County Hall, Hertford. They were deposited by the hospital in 1994. The word ‘deposit’ is meaningful, in that they were not given to the archives, but are merely on deposit. Ownership is now with the Hertfordshire Partnership NHS Foundation Trust, the successor body to all the authorities who had previously run the hospital. But HALS has been appointed a ‘Place of Deposit’ and so can hold, on behalf of the Lord Chancellor, public records such as these. The term ‘public records’ does not mean that the public has access to them (see the page explaining access). 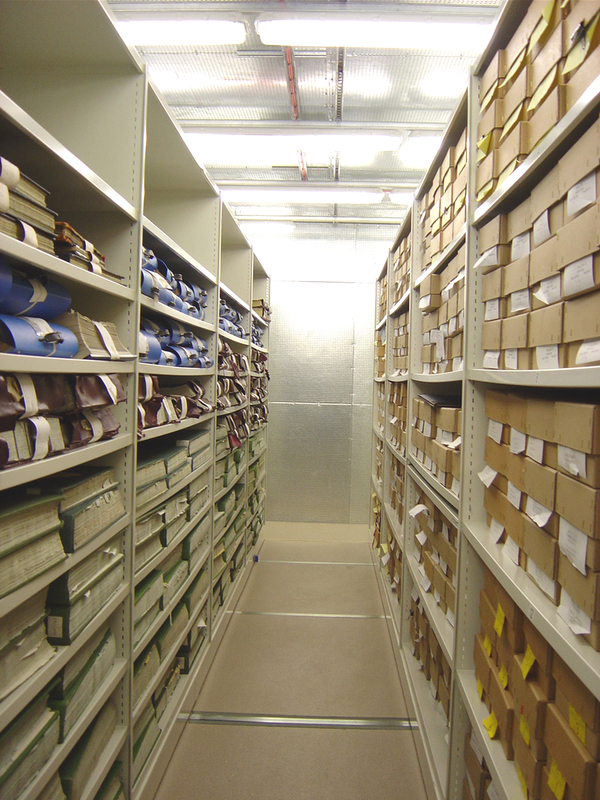 When any item or collection is brought to the archives it is immediately given an accession number. The Hill End material was given the number Off Acc 1025. It was then packed in acid-free boxes, and a rough list made of what the boxes contained. We call this an ‘interim list’ as it is to be used ‘in the interim’ before the collection is catalogued. An accession’s interim list differs from the catalogue that it eventually becomes. The list is simply a flat, relatively meaningless box-list that tells us what we have and allows items to be located and consulted. However, it is the job of the archivist to transform this list into a catalogue. The Hill End records were catalogued early in 2009. A catalogue contains more detailed descriptions of items, set within a hierarchy which attempts to reflect the administrative structure of the creator of the records, the way they were created, or simply to arrange them in a meaningful and usable way. Each item in the interim list was allocated an item number (eg Off Acc 1025 Item 62), so that each would be identifiable. Those references were then fed into a catalogue structure in CALM – our archive cataloguing software. No ‘cataloguing scheme’ could be found, so the main headings to put records under (eg Administration, Patients, Photographs) were determined by what records we had, and by what headings other people had used for similiar catalogues. Although you cannot always see them, a catalogue has levels at which items are described at. So the hospital itself would be described at a very high level – of course, due to its size, that is not an item that can be ordered and looked at in the archive reading room! Further down may be a series level, such as ‘admissions registers’, and again this cannot be ordered as it is simply a heading. At the file or item level is finally a real thing, that has a reference number and can be ordered. Much of the cataloguing time was devoted to recording exactly what kind of information and dates were covered by each item, which helps us when we have to decide if the sensitive information inside can be seen or not. Once all the items had been fed into this catalogue structure in our CALM database, and described fully, their unique reference numbers could be allocated to them. These are the document references to be found next to their descriptions, and which you would use if you were to order the item or to enquire about it. Each item had to then be physically labelled with that number, and placed in a box also labelled up with the numbers contained within.